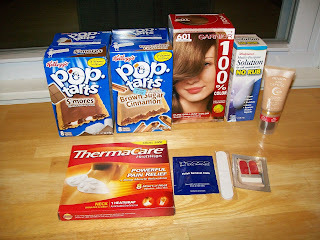 Frugal & Fabulous: Walgreens - FAR items & some good deals! Walgreens - FAR items & some good deals! I realized tonight that I hadn't been to Walgreens in almost two weeks! So I stopped into my favorite store to scoop the deals! 2 - Boxes of Pop Tarts ($1.50 ea with in ad coupon) used $1/1 peelies = $.50 ea! Great job shopping (as always!). I went to a couple different Walgreens yesterday and had a hard time finding the Revlon makeup. I really want to buy it ASAP because the $2 coupon I have expires 2/15, but the one store was totally out of the lip creme/gloss. Hopefully they'll get more in stock soon. You have to tell me more about this Roku box! From what I read on the website, you buy the box for about $100 and then you can watch instantly anything from Netflix. You still get your regular movies from Netflix in the mail as well. Is that right? That would be an awesome alternative to cable! There are a bunch of shows I watch on cable, but I could just wait until they come out on DVD to watch them. If I cut down to basic cable, this would probably pay for itself in about three months! I'm liking this idea a lot! Great Walgreeens deals! I haven't been to Walgreens in a couple of weeks, either. I guess I better go this weekend. Need the poptarts to send to our son in Iraq.